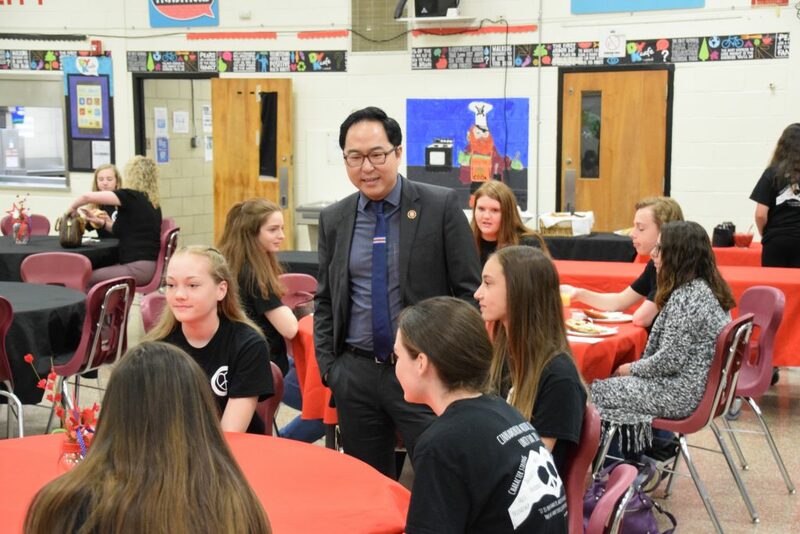 Congressman Andy Kim speaks with student members of Cinnaminson Middle School’s Unity Club at a meet and greet event during the school’s Unity Day celebrations. On Tuesday, April 9, words like “trust,” “integrity,” “tolerance” and “respect” adorned the walls of Cinnaminson Middle School. These words make up just a few of the tenets of the school’s Unity Club, celebrated annually with a series of programs and festivities that make up Unity Day. The club’s theme this year has been “Character Strong, Pirate Proud.” Co-advisors Melissa DeClementi and Alison Palat organized a number of service projects and character-building field trips for the group with an overall goal of promoting unity within their school and community and exposing their club members to the outside world. The club’s activities throughout the year, from service projects like making sandwiches for Camden’s Cathedral Kitchen to outings like its trip to Arlington National Cemetery, were highlighted during a school-wide assembly featuring guest speakers Assemblywoman Carol Murphy and Congressman Andy Kim. Prior to the assembly, a meet-and-greet was held in the school’s cafeteria where Unity Club students got a chance to rub elbows with members of their township committee as well as the event’s two guest speakers. Kim, who said he was impressed with the level of excitement and energy on display at the middle school, was even more impressed by the students he met and their willingness to serve others. “I’ve gotten to talk to a lot of different students here today, and they’ve been talking about trips they’ve gone on, the service projects that they’ve done, and what I was really excited about was one of them was telling me that they find this a lot of fun, too. I think that that’s just such a great place to be. I’ve dedicated my life to serving other people, and it’s great to see that start at a young age,” said Kim. “What brings me here are the students,” said Murphy, who also met with a number of CMS students during the meet-and-greet. Reading the words on the wall, Murphy pointed to “tolerance” as something she wishes to see more of in today’s world. “We somehow have forgotten about tolerance in the world, about tolerating one another and respecting each other and knowing that we are all equal in what we do,” said Murphy. Speaking at the assembly, Murphy continued to stress the importance of tolerance in her own role as an assemblywoman. “We as public servants have to be tolerant of each and every person who wants to be a part of a greater America than what we have now. Our future is bright when it comes to what I see here today,” said Murphy. Following her speech, Murphy presented the middle school with a proclamation from the state General Assembly and Senate, signed by Senate President Stephen Sweeney and Assembly Speaker Craig Coughlin, recognizing CMS students for their service through Unity Club. Keynote speaker Kim shared some of his experience growing up the son of immigrants who found a new start in America and passed on advice about service he received from his parents when he was young. “My parents always taught me that service isn’t just a job, it’s a way of life,” said Kim.